Newton Castle once stood on the north bank of the River Ayr, however nothing of it now remains. Exactly when Newton Castle was first built is unknown, however there is thought to have been a castle here since at least 1200, making it contemporary with Ayr Castle on the opposite bank of the River Ayr. The site occupies ground that rises gently from the river bank. When King Haakon IV of Norway arrived in Scotland in 1263, with a reputed 160 ships carrying 20,000 men, he landed at Ayr where he took the castle there along with Newton Castle. Attempts to agree a treaty with the invaders failed, and led to the famous Battle of Largs after which both castles presumably returned to Scottish hands. Newton was established as a Burgh of Barony of Ayr in the 14th century, probably by Robert the Bruce in recognition of 48 of its inhabitants who fought with him at Bannockburn. It seems entirely possible and likely that the castle was rebuilt or extended around this time, when it was said to have at its core a small square tower. The castle is said to have been built by the Wallaces of Craigie, although which period of the castle’s construction, and whether the Wallaces were the original owners and builders, is unclear. In 1468 Newton Castle belonged to Adam Wallace, a relative of the Wallaces of Craigie. But in 1539 it was granted by James V to Sir William Hamilton, the Provost of Ayr, along with the lands of Sanquhar, and was temporarily renamed Sanquhar-Hamilton Castle. Hamilton was married to Annabel Wallace, of the Wallaces of Craigie. In 1585 Newton Castle was the temporary residence of James Stewart, the Earl of Arran. 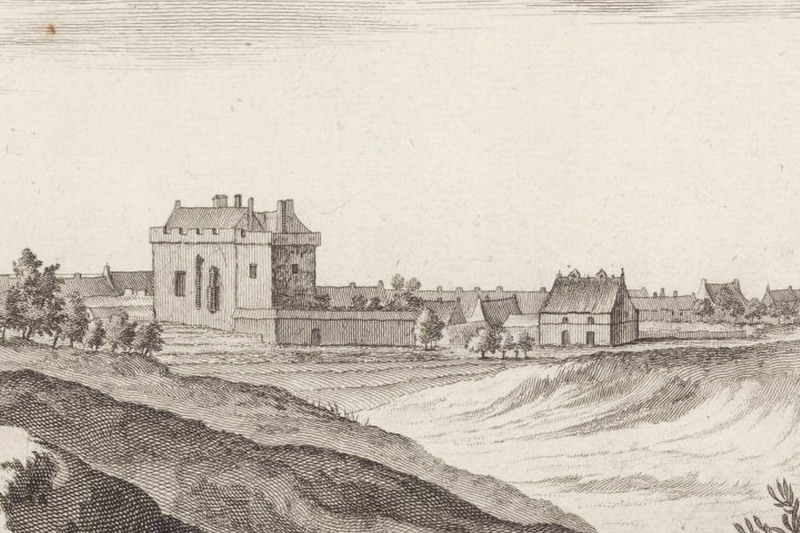 Hamilton’s possession of Newton Castle was successfully challenged by the Wallaces at the Court of Session in Edinburgh, and in 1587 the castle was granted to John Wallace of Burnbank. The following year it passed to the Craigie branch of the Wallaces, and it became their main seat, replacing Craigie Castle. When it was drawn by Slezer in 1693 in his engraving of “The Town of Aire, from ye House of Newtowne” it had the appearance of an extended 15th century tower, with a courtyard wall extending from it. If this drawing is accurate, then the castle would appear to have been aligned approximately north to south. Outside the courtyard wall was a large doocot with pitched roof. Craigie, 3rd Bt., died there and was succeeded by his brother, Thomas Wallace of Elderslie. Nothing now remains of Newton Castle, and the site of it falls at the corner of a car park. Newton Castle is in the parish of Ayr and the county of Ayrshire. Published on the 18th of May 2012 at 6:14 pm. Updated on the 28th of July 2013 at 3:02 pm.